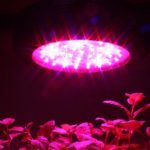 As I become more involved with the indoor growing culture one thing has become abundantly obvious to me – safety has to be a primary concern when you’re growing plants indoors. The heat given off by traditional indoor plant lighting can be quite extreme which can lead to the potential for fire hazards if you’re not careful. That’s why I decided to turn to LED lights as they give off up to 90% less heat, which means they are a much safer option and it doesn’t hurt that you can save a lot of money since you don’t have to purchase expensive cooling equipment as well. 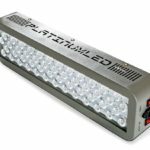 There are a ton of great options when it comes to LED lights, and an affordable option that takes safety very seriously is the MarsHydro Mars300 LED Grow Light. 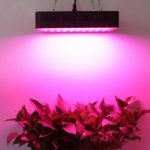 This light is appropriate for the entire growing cycle of your plants and you should be able to find this one for under $200. It isn’t the most powerful option on the market at only 132W, but it does give off enough light energy to be a decent option for a small grow operation. 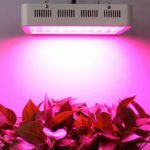 MarsHydro claim that this grow light is a full spectrum model, but it doesn’t include ultraviolet or infrared lights so I have to say their claim is actually false. It’s a puzzle to me how many companies there are out there that manufacture LED lights and claim to offer a full spectrum lighting system yet fail to include these two parts of the spectrum. 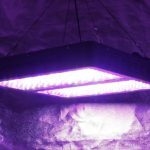 There may be some debate as to how useful infrared and ultraviolet lights are in the growing process, but most growing experts feel that they do add some overall benefit – the fact that they’re missing in this lighting system is a disappointment. 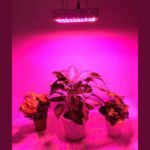 There are many things you have to keep in mind when you’re looking at a safe growing operation, and one of those is how your lighting system connects to a power source. This system has an isolated power supply for added safety and, according to the manufacturer, it uses the highest quality parts that don’t take any shortcuts. The cord and plug are both VDE and UL certified, which seems to back up their claim; that is a comfort, as an electrical fire would not only damage your crops but it would also likely cause you serious financial hardship. Another obvious safety concern when you’re dealing with any type of lighting is the heat given off by the bulbs, and of course that’s one of the best things about LEDs – they give off a lot less heat. 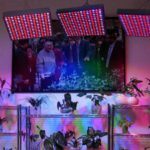 The manufacturers of this MarsHydro Mars300 LED Grow Light have also taken a couple of extra safety precautions to reduce the risk of fire from the heat even further. They’ve included heatsinks made out of aluminum that are designed to cool off the lighting system. They also include two internal fans to cool things down even further. Can You Be Confident in the Warranty? The type of warranty that a manufacturer of any product offers is one simple way of judging how confident the manufacturer is in their own product. I have to say I was a little disappointed in the warranty offered for this lighting system. They only provide you with a one-year warranty and that isn’t even comparable to the industry average, which is about two years. They do provide you with a full 30 day money back guarantee and that’s positive, but overall I’m still disappointed in the warranty for this product. How Far Does the Light Go? 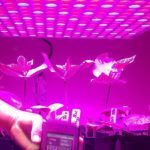 One of the most important questions you’ll want to consider when deciding on the right LED lighting system for your own grow op is how well will the light does at covering the plants in your operation. This system measures 12” x 8” x 3” and that gives it an overall coverage area of about 4 ft.² – that’s not overwhelming, but it is about average. If you have a larger plant growing operation than 4 ft.² you’ll have to purchase multiple lights for your operation. When Will You Need to Replace It? Where this light really excels is in its lasting power – it’s designed to last for up to 100,000 hours. If you translate that into days or years that means you’re likely to get between 10 and 12 years of use out of this lighting system. LED lights may seem like they cost a little more, but when you consider how long they last and the fact that you don’t need an expensive cooling system for them, they’re actually more affordable than traditional lighting systems in the long term. The biggest test of a lighting system, though, is how reliable they are. After all, you don’t want to buy a lighting system that you’ll simply have to replace in a few months and, unfortunately, quite a few customers have complained about this exact problem with this lighting system. Several suggested that the lights began flickering almost immediately and that within one to three months they failed altogether. While it’s true that your one-year warranty would protect you against this type of problem, it’s still a pain to have to return a product. 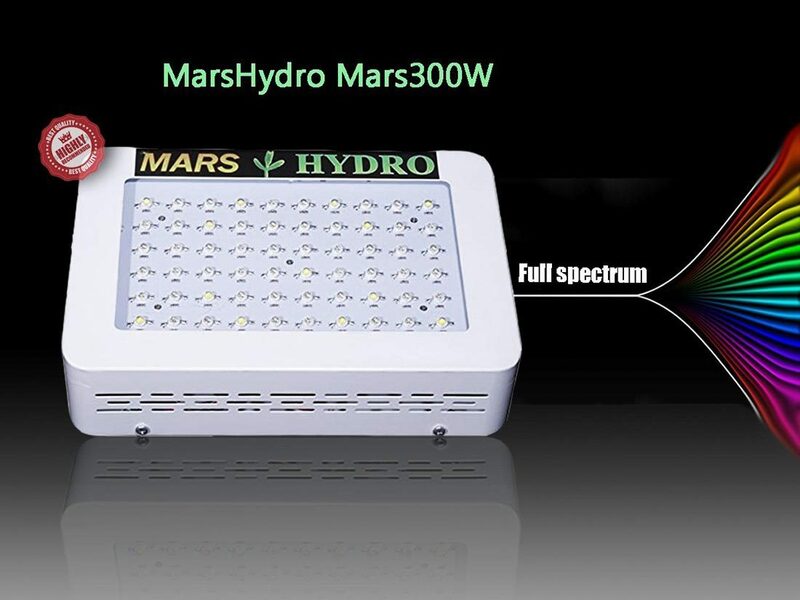 There are just too many things that concerned me about the MarsHydro Mars300 LED Grow Light for me to feel good about endorsing it. The fact that it’s missing ultraviolet and infrared bulbs is a disappointment and what’s even more disappointing is the potential for this light to stop working altogether in its first three months – that’s hard to overlook.